GN'R were reportedly paid one million US dollars to play a private show Friday night (October 29) in Moscow for Alexander Chistyakov, the deputy chairman of the management board of Federal Grid Company (FGC). 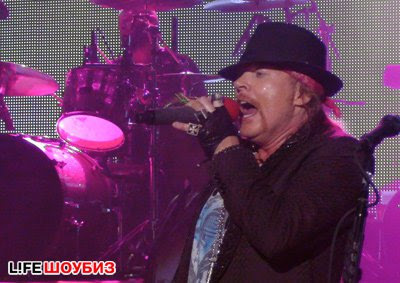 The concert took place at a studio at Mosfilm (a Russian movie company), with GN'R singer Axl Rose arriving at the location at 2 AM (early Saturday morning). Guards were reportedly notified of his arrival 40 minutes before he showed up. They were asked to arrange "a green corridor" so all celebrities were asked to leave the VIP area and proceed to the general-admission area. To attend the concert, each invited guest had to pay about $1,000. Video footage of GN'R's performance can be viewed below. In addition to sole original member Axl Rose (vocals), the current lineup of GN'R includes guitarists Dj Ashba, Ron Thal and Richard Fortus, bassist Tommy Stinson, keyboardists Dizzy Reed and Chris Pitman and drummer Frank Ferrer. GN'R'S latest album, Chinese Democracy, was released in November 2008 as a Best Buy exclusive, 17 years after the last all-original Guns sets, Use Your Illusion I & II. The album was a commercial disappointment, selling less than one million copies in the US (according to Nielsen SoundScan) despite the long wait. Duff McKagan Joins GN'R on Stage in London!